How politics of the past make modern mud-slinging look downright demure. With the presidential campaign grinding onward, it’s common to hear pundits and politicians slip into hyperbole about the state of political discourse today. Shaking their heads gravely, they complain that it’s never been as partisan, as divisive, as unethical or extreme. Nuh-uh, says over 200 years of American history. In reality, the attacks employed by modern politicians and their supporters are mere echoes of the nasty and fevered rhetoric that has been employed by Whigs and wags across America for over 200 years. Everyone loves the founding fathers — those sage intellectuals who gaze benevolently at us from our coins and South Dakota mountains. 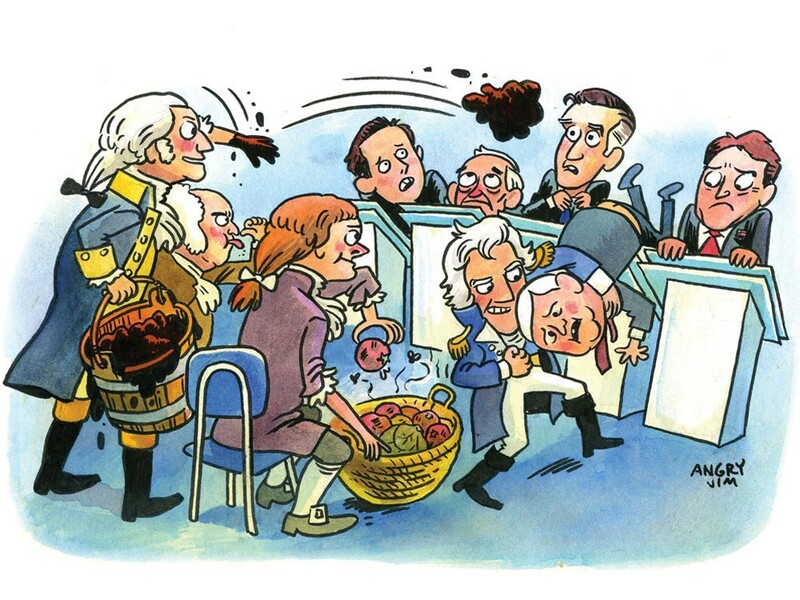 But when founding fathers John Adams and Thomas Jefferson went at each other for president in 1800, things got nasty. The crazy thing? Jefferson and Adams were lifelong friends. The attempted assassination of Rep. Gabrielle Giffords sparked a national debate about whether our political discourse had become too militaristic. Now consider the reaction if a congressman was beaten nearly to death not by a mentally ill stalker but by a fellow congressman. That was the case with Sen. Charles Sumner, who, in May of 1856, delivered an epic two-day speech condemning South Carolina Sen. Andrew Butler for being an errand-boy for the cause of slavery. A few days later, Butler’s cousin, Congressman Preston Brooks, walked up to Sumner in the Senate chamber and beat him with his cane until he was unconscious, nearly killing him. It took three years before Sumner could serve in the Senate again. And instead of nationwide condemnation, Brooks received several gifts from his Southern supporters: new canes. The slavery debates between Abraham Lincoln and Stephen Douglas in 1858 are often held up as an example of great, high-minded discourse. But historians say those debates featured as much name-calling, sarcasm, dodging, distortion and pandering as any televised debate today. Nowadays, the worst fate presidential candidates might suffer for expressing unpopular beliefs on social issues is to have glitter thrown at them. But when Democratic presidential candidate Al Smith arrived in Oklahoma City in 1924, his train rolled past burning crosses. Smith was Catholic and against Prohibition — that’s all it took to anger the Klan. For much of American history, taking certain cultural stands could cost lives, not just elections. Last summer’s frustrating debt-ceiling negotiations in Congress almost made one pine for the 1990s, when Democratic President Bill Clinton and Republican Speaker of the House Newt Gingrich managed to successfully reform welfare, despite their political animosity. Except, back then, the government actually shut down. In the winter of 1995 and 1996, the budget disputes between Clinton and the Gingrich-controlled Congress shut down non-essential parts of the government for 28 full days. Worse, Gingrich said some of his inflexibility had to do with anger over being snubbed, ignored and asked to use the plane’s rear exit on a flight he and Clinton shared. “This is petty,” Gingrich had said. He was referring to Clinton. So when the storm of dishonest attack ads arrives this year, in ominous baritone and gritty black-and-white, don’t lament the state of democracy. Revel in an age-old American pastime.